Bargain Shopping Paradise: Remember . . . share your bargain secrets tomorrow! Remember . . . share your bargain secrets tomorrow! Tomorrow is Bargain Brag Wednesday . . . no wait! Thank you for all your valuable feed back on the name change for the former Bargain Brag Wednesdays. There were a couple of ties for the name suggestions, but I've settled on "Wallet-Friendly Wednesday," so the day won't change—just the name. Gather your projects, ideas, tips, brags, etc., and link-up tomorrow. 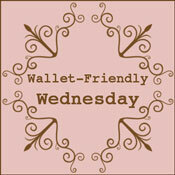 Every week, I feature frugal projects on "Wallet-Friendly Wednesday." If you have a fun, budget-friendly bargain shopping find, thrift store deal, DIY project, side-of-the-road pick-up, consignment shop steal—ANYTHING you've done that's saved your money—don't forget to link up tomorrow. It opens early, and stays up all week long. Next Wednesday, I'll feature a project from this week's link up, and it could be yours! So, grab the button and get blogging about your fabulously creative and frugally-conscious ideas. Then, come back here and link up tomorrow, June 30! And, don't forget . . . the Rosebud Lips giveaway ends on Sunday @ 2 PM (Eastern). Enter now!